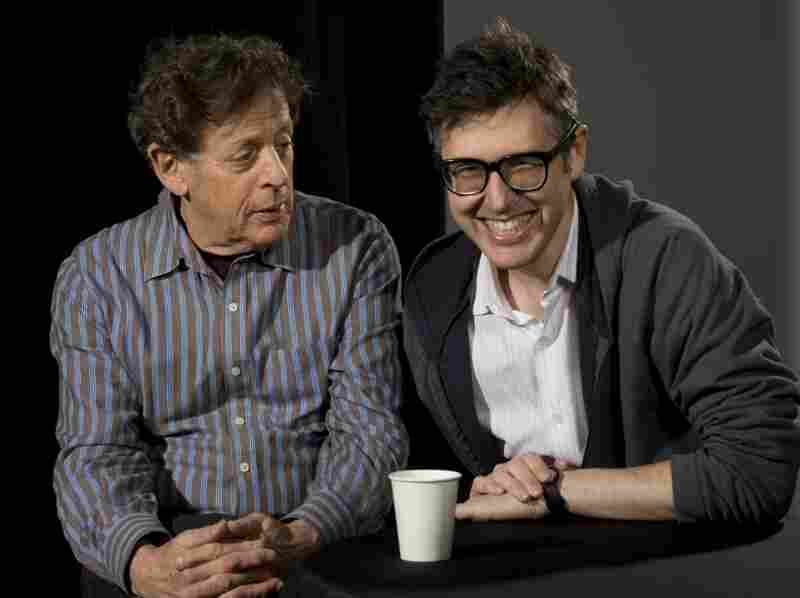 Ira Glass Interviews His Cousin, Composer Philip Glass It's no coincidence that composer Philip Glass and This American Life host Ira Glass have the same last name: They're second cousins. On today's Fresh Air, we replay excerpts from an onstage conversation between Ira and Philip in honor of the latter's 75th birthday. This interview was originally broadcast on Sept. 21, 1999. It's no coincidence that composer Philip Glass and This American Life host Ira Glass have the same last name: They're second cousins, but they didn't know each other well when the Field Museum in the Chicago asked Ira to interview Philip on stage in 1999. On today's Fresh Air, we replay excerpts from that conversation in honor of Philip's 75th birthday, which is Tuesday. Philip Glass is one of the fathers of minimalist music. He started off writing for his ensemble and went on to write operas, dances and film scores, including the music for Koyaanisqatsi, Kundun, The Fog of War, No Reservations and The Thin Blue Line. Performed by the Bruckner Orchester Linz, conducted by Dennis Russell Davies, and now available on iTunes. "I worked there from the age of 12 until I was in my 20s. In those days, those were the old 78s. And all the records were scratched anyway, so you could play anything. So we played music all the time. By 15, I became the classical record buyer for the store. And I learned a lot because I was the one who ordered the records." "He began as an auto mechanic. And then at a certain point in the 1920s and 30s, people started putting radios into cars. So he began fixing the radios just the same way he fixed the cars. He learned how to fix radios. Then he got interested in the radios and got rid of the cars and just had a radio shop. Then someone told him that he should sell some records in the radio shop, and gradually, over 10 or 15 years, the record part became bigger and bigger and bigger." "My first job, my brother and I, on the weekends, we went down to the store, and we jumped on records. ... That was my first professional job." "In order to arrive at a personal style, you have to have a technique to begin with. In other words, when I say that style is a special case of technique, you have to have the technique — you have to have a place to make the choices from. If you don't have a basis on which to make the choice, then you don't have a style at all. You have a series of accidents." "I consider the first 20 performances just learning the piece. Think about it this way: If you think about a pianist who plays a Schubert sonata through his whole lifetime — if you listen to Rubenstein or Horowitz playing their repertoire later in their life, you understand the richness with which they play that music, and how differently they must have played it when they were younger. ... I think it's only after about 20 performances that we begin to understand what the dynamic structure of the piece is."